Amlodipine Besylate with NDC 70518-1914 is a a human prescription drug product labeled by Remedyrepack Inc.. The generic name of Amlodipine Besylate is amlodipine besylate. The product's dosage form is tablet and is administered via oral form. FDA Application Number: ANDA078043 What is the FDA Application Number? Amlodipine besylate tablets are indicated for the treatment of hypertension, to lower blood pressure. Lowering blood pressure reduces the risk of fatal and nonfatal cardiovascular events, primarily strokes and myocardial infarctions. These benefits have been seen in controlled trials of antihypertensive drugs from a wide variety of pharmacologic classes including amlodipine besylate.Control of high blood pressure should be part of comprehensive cardiovascular risk management, including, as appropriate, lipid control, diabetes management, antithrombotic therapy, smoking cessation, exercise, and limited sodium intake. Many patients will require more than one drug to achieve blood pressure goals. For specific advice on goals and management, see published guidelines, such as those of the National High Blood Pressure Education Program's Joint National Committee on Prevention, Detection, Evaluation, and Treatment of High Blood Pressure (JNC).Numerous antihypertensive drugs, from a variety of pharmacologic classes and with different mechanisms of action, have been shown in randomized controlled trials to reduce cardiovascular morbidity and mortality, and it can be concluded that it is blood pressure reduction, and not some other pharmacologic property of the drugs, that is largely responsible for those benefits. The largest and most consistent cardiovascular outcome benefit has been a reduction in the risk of stroke, but reductions in myocardial infarction and cardiovascular mortality also have been seen regularly.Elevated systolic or diastolic pressure causes increased cardiovascular risk, and the absolute risk increase per mmHg is greater at higher blood pressures, so that even modest reductions of severe hypertension can provide substantial benefit. Relative risk reduction from blood pressure reduction is similar across populations with varying absolute risk, so the absolute benefit is greater in patients who are at higher risk independent of their hypertension (for example, patients with diabetes or hyperlipidemia), and such patients would be expected to benefit from more aggressive treatment to a lower blood pressure goal.Some antihypertensive drugs have smaller blood pressure effects (as monotherapy) in black patients, and many antihypertensive drugs have additional approved indications and effects (e.g., on angina, heart failure, or diabetic kidney disease). These considerations may guide selection of therapy.Amlodipine besylate tablets may be used alone or in combination with other antihypertensive agents. Chronic Stable Angina Amlodipine besylate tablets are indicated for the symptomatic treatment of chronic stable angina. Amlodipine besylate tablets may be used alone or in combination with other antianginal agents. Vasospastic Angina (Prinzmetal's or Variant Angina) Amlodipine besylate tablets are indicated for the treatment of confirmed or suspected vasospastic angina. Amlodipine besylate tablets may be used as monotherapy or in combination with other antianginal agents. Angiographically Documented CAD In patients with recently documented CAD by angiography and without heart failure or an ejection fraction <40%, amlodipine besylate tablets are indicated to reduce the risk of hospitalization for angina and to reduce the risk of a coronary revascularization procedure. Tablets: 2.5 mg pink color mottled, round, flat-faced, beveled edged tablets debossed with "L" on one side and "28" on the other side. Tablets: 5 mg white to off white capsule shaped tablets debossed with "L" on one side and "29" on the other side. Tablets: 10 mg white to off white round, flat faced, beveled edged tablet debossed with "L" on one side and "32" on the other side. 1 back pain, hot flushes, malaise, pain, rigors, weight gain, weight decrease. 1 and female), insomnia, nervousness, depression, abnormal dreams, anxiety, depersonalization. 1 rash erythematous, rash maculopapular. Special Sensesabnormal vision, conjunctivitis, diplopia, eye pain, tinnitus. Urinary Systemmicturition frequency, micturition disorder, nocturia. Autonomic Nervous Systemdry mouth, sweating increased. Metabolic and Nutritionalhyperglycemia, thirst. Hemopoieticleukopenia, purpura, thrombocytopenia.1These events occurred in less than 1% in placebo-controlled trials, but the incidence of these side effects was between 1% and 2% in all multiple dose studies. , the adverse event profile was similar to that reported previously (see above), with the most common adverse event being peripheral edema. Amlodipine besylate tablet is right for you. What is Amlodipine Besylate Tablet?Amlodipine besylate tablet is a type of medicine known as a calcium channel blocker (CCB). It is used to treat high blood pressure (hypertension) and a type of chest pain called angina. It can be used by itself or with other medicines to treat these conditions. High Blood Pressure (hypertension)High blood pressure comes from blood pushing too hard against your blood vessels. Amlodipine besylate tablet relaxes your blood vessels, which lets your blood flow more easily and helps lower your blood pressure. Drugs that lower blood pressure lower your risk of having a stroke or heart attack. AnginaAngina is a pain or discomfort that keeps coming back when part of your heart does not get enough blood. Angina feels like a pressing or squeezing pain, usually in your chest under the breastbone. Sometimes you can feel it in your shoulders, arms, neck, jaws, or back. Amlodipine besylate tablets can relieve this pain. Amlodipine besylate tablets), or to the inactive ingredients. Your doctor or pharmacist can give you a list of these ingredients. Amlodipine besylate tablet is the best treatment for you. Amlodipine besylate tablet once a day, with or without food. Amlodipine besylate tablets at a time. Amlodipine besylate tablets if it has been more than 12 hours since you missed your last dose. Wait and take the next dose at your regular time. Amlodipine besylate tablets, do not stop taking your other prescription medicines, including any other blood pressure medicines, without talking to your doctor. Amlodipine besylate tablets, call your doctor or Poison Control Center, or go to the nearest hospital emergency room right away. What should I avoid while taking Amlodipine Besylate Tablets?Do not start any new prescription or non-prescription medicines or supplements, unless you check with your doctor first. Amlodipine besylate tablets or increase your dose, you may have a heart attack or your angina may get worse. If that happens, call your doctor right away or go directly to a hospital emergency room. Amlodipine besylate tablets. For a complete list, ask your doctor or pharmacist. Amlodipine besylate tablets in a dry place. Amlodipine besylate tablets to other people, even if they have the same symptoms you have. It may harm them. 1/2) is 56 hours in patients with impaired hepatic function, titrate slowly when administering amlodipine besylate to patients with severe hepatic impairment. Because these reactions are reported voluntarily from a population of uncertain size, it is not always possible to reliably estimate their frequency or establish a causal relationship to drug exposure.The following postmarketing event has been reported infrequently where a causal relationship is uncertain: gynecomastia. In postmarketing experience, jaundice and hepatic enzyme elevations (mostly consistent with cholestasis or hepatitis), in some cases severe enough to require hospitalization, have been reported in association with use of amlodipine.Postmarketing reporting has also revealed a possible association between extrapyramidal disorder and amlodipine.Amlodipine has been used safely in patients with chronic obstructive pulmonary disease, well-compensated congestive heart failure, coronary artery disease, peripheral vascular disease, diabetes mellitus, and abnormal lipid profiles. [see Data]. The estimated background risk of major birth defects and miscarriage for the indicated population is unknown. All pregnancies have a background risk of birth defect, loss or other adverse outcomes. In the U.S. general population, the estimated background risk of major birth defects and miscarriage in clinically recognized pregnancies is 2% to 4% and 15% to 20%, respectively.Clinical Considerations:Disease-associated maternal and/or embryo/fetal risk Hypertension in pregnancy increases the maternal risk for pre-eclampsia, gestational diabetes, premature delivery, and delivery complications (e.g., need for cesarean section and post-partum hemorrhage). Hypertension increases the fetal risk for intrauterine growth restriction and intrauterine death. Pregnant women with hypertension should be carefully monitored and managed accordingly.Data:Animal DataNo evidence of teratogenicity or other embryo/fetal toxicity was found when pregnant rats and rabbits were treated orally with amlodipine maleate at doses up to 10 mg amlodipine/kg/day (approximately 10 and 20 times the MRHD based on body surface area, respectively) during their respective periods of major organogenesis. However for rats, litter size was significantly decreased (by about 50%) and the number of intrauterine deaths was significantly increased (about 5-fold)in rats receiving amlodipine maleate at a dose equivalent to 10 mg amlodipine/kg/day for 14 days before mating and throughout mating and gestation. Amlodipine maleate has been shown to prolong both the gestation period and the duration of labor in rats at this dose. Risk Summary Limited available data from a published clinical lactation study reports that amlodipine is present in human milk at an estimated median relative infant dose of 4.2%. No adverse effects of amlodipine on the breastfed infant have been observed. There is no available information on the effects of amlodipine on milk production. 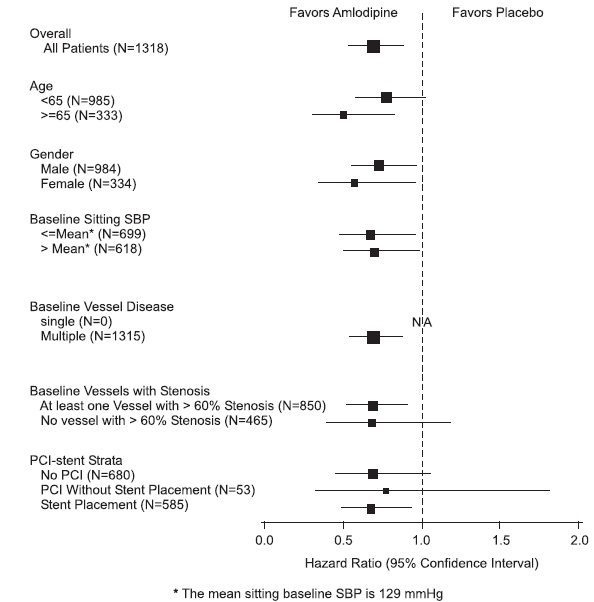 Effect of Amlodipine besylate on blood pressure in patients less than 6 years of age is not known. 2 basis) caused a marked peripheral vasodilation and hypotension. Amlodipine besylate is a white crystalline powder with a molecular weight of 567.1. It is slightly soluble in water and sparingly soluble in ethanol. Amlodipine besylate tablets USP are formulated as tablets equivalent to 2.5 mg, 5 mg and 10 mg of amlodipine for oral administration. In addition to the active ingredient, amlodipine besylate, each tablet contains the following inactive ingredients: colloidal silicon dioxide, dicalcium phosphate anhydrous, FD & C red no. 40 aluminum lake (only for 2.5 mg strength), magnesium stearate, microcrystalline cellulose and povidone.USP dissolution test for Amlodipine besylate tablets is pending. in vitro but such effects have not been seen in intact animals at therapeutic doses. Serum calcium concentration is not affected by amlodipine. Within the physiologic pH range, amlodipine is an ionized compound (pKa=8.6), and its kinetic interaction with the calcium channel receptor is characterized by a gradual rate of association and dissociation with the receptor binding site, resulting in a gradual onset of effect. in vitro. This inhibition of coronary spasm is responsible for the effectiveness of amlodipine in vasospastic (Prinzmetal's or variant) angina. After oral administration of therapeutic doses of amlodipine, absorption produces peak plasma concentrations between 6 and 12 hours. Absolute bioavailability has been estimated to be between 64 and 90%. The bioavailability of amlodipine is not altered by the presence of food. Amlodipine is extensively (about 90%) converted to inactive metabolites via hepatic metabolism with 10% of the parent compound and 60% of the metabolites excreted in the urine. Ex vivo studies have shown that approximately 93% of the circulating drug is bound to plasma proteins in hypertensive patients. Elimination from the plasma is biphasic with a terminal elimination half-life of about 30 to 50 hours. Steady-state plasma levels of amlodipine are reached after 7 to 8 days of consecutive daily dosing. The pharmacokinetics of amlodipine are not significantly influenced by renal impairment. Patients with renal failure may therefore receive the usual initial dose. Elderly patients and patients with hepatic insufficiency have decreased clearance of amlodipine with a resulting increase in AUC of approximately 40 to 60%, and a lower initial dose may be required. A similar increase in AUC was observed in patients with moderate to severe heart failure. Drug interactions In vitro data indicate that amlodipine has no effect on the human plasma protein binding of digoxin, phenytoin, warfarin, and indomethacin. 2 basis, similar to the maximum recommended human dose of 10 mg amlodipine/day. 2 basis, about twice the maximum recommended human dose. Adult PatientsThe antihypertensive efficacy of amlodipine has been demonstrated in a total of 15 double-blind, placebo-controlled, randomized studies involving 800 patients on amlodipine and 538 on placebo. Once daily administration produced statistically significant placebo-corrected reductions in supine and standing blood pressures at 24 hours postdose, averaging about 12/6 mmHg in the standing position and 13/7 mmHg in the supine position in patients with mild to moderate hypertension. Maintenance of the blood pressure effect over the 24-hour dosing interval was observed, with little difference in peak and trough effect. Tolerance was not demonstrated in patients studied for up to 1 year. The 3 parallel, fixed dose, dose response studies showed that the reduction in supine and standing blood pressures was dose-related within the recommended dosing range. Effects on diastolic pressure were similar in young and older patients. The effect on systolic pressure was greater in older patients, perhaps because of greater baseline systolic pressure. Effects were similar in black patients and in white patients.Pediatric PatientsTwo hundred sixty-eight hypertensive patients aged 6 to 17 years were randomized first to amlodipine 2.5 or 5 mg once daily for 4 weeks and then randomized again to the same dose or to placebo for another 4 weeks. Patients receiving 2.5 mg or 5 mg at the end of 8 weeks had significantly lower systolic blood pressure than those secondarily randomized to placebo. The magnitude of the treatment effect is difficult to interpret, but it is probably less than 5 mmHg systolic on the 5 mg dose and 3.3 mmHg systolic on the 2.5 mg dose. Adverse events were similar to those seen in adults. The effectiveness of 5 to 10 mg/day of amlodipine in exercise-induced angina has been evaluated in 8 placebo-controlled, double-blind clinical trials of up to 6 weeks duration involving 1038 patients (684 amlodipine, 354 placebo) with chronic stable angina. In 5 of the 8 studies, significant increases in exercise time (bicycle or treadmill) were seen with the 10 mg dose. Increases in symptom-limited exercise time averaged 12.8% (63 sec) for amlodipine 10 mg, and averaged 7.9% (38 sec) for amlodipine 5 mg. Amlodipine 10 mg also increased time to 1 mm ST segment deviation in several studies and decreased angina attack rate. The sustained efficacy of amlodipine in angina patients has been demonstrated over long-term dosing. In patients with angina, there were no clinically significant reductions in blood pressures (4/1 mmHg) or changes in heart rate (+0.3 bpm). In a double-blind, placebo-controlled clinical trial of 4 weeks duration in 50 patients, amlodipine therapy decreased attacks by approximately 4/week compared with a placebo decrease of approximately 1/week (p<0.01). Two of 23 amlodipine and 7 of 27 placebo patients discontinued from the study due to lack of clinical improvement. 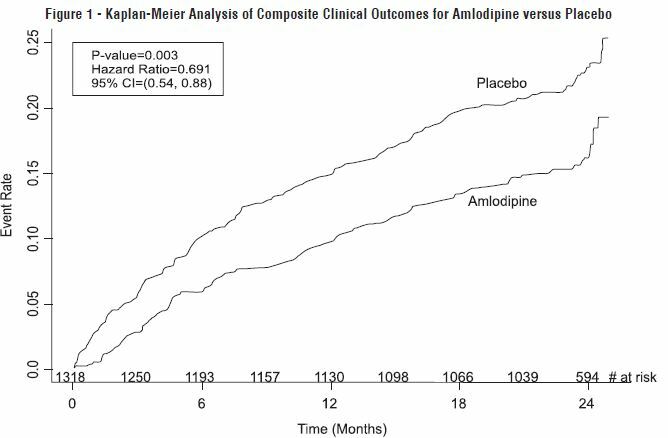 Amlodipine has been compared to placebo in four 8 to 12 week studies of patients with NYHA Class II/III heart failure, involving a total of 697 patients. In these studies, there was no evidence of worsened heart failure based on measures of exercise tolerance, NYHA classification, symptoms, or left ventricular ejection fraction. In a long-term (follow-up at least 6 months, mean 13.8 months) placebo- controlled mortality/morbidity study of amlodipine 5 to 10 mg in 1153 patients with NYHA Classes III (n=931) or IV (n=222) heart failure on stable doses of diuretics, digoxin, and ACE inhibitors, amlodipine had no effect on the primary endpoint of the study which was the combined endpoint of all-cause mortality and cardiac morbidity (as defined by life-threatening arrhythmia, acute myocardial infarction, or hospitalization for worsened heart failure), or on NYHA classification, or symptoms of heart failure. Total combined all-cause mortality and cardiac morbidity events were 222/571 (39%) for patients on amlodipine and 246/583 (42%) for patients on placebo; the cardiac morbid events represented about 25% of the endpoints in the study.Another study (PRAISE-2) randomized patients with NYHA Class III (80%) or IV (20%) heart failure without clinical symptoms or objective evidence of underlying ischemic disease, on stable doses of ACE inhibitors (99%), digitalis (99%), and diuretics (99%), to placebo (n=827) or amlodipine (n=827) and followed them for a mean of 33 months. There was no statistically significant difference between amlodipine and placebo in the primary endpoint of all-cause mortality (95% confidence limits from 8% reduction to 29% increase on amlodipine). With amlodipine there were more reports of pulmonary edema.